The all-new A5 Coupé is now open for ordering with prices starting from £30,700 on the road. Its modern, elegant exterior is complemented by sophisticated aerodynamics, an all-new chassis, powerful engines, and innovative infotainment and driver assistance systems. To download the new pricing and specification guide click here. 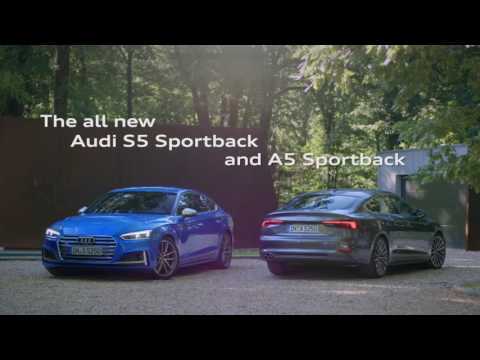 After the birth of the 1st generation A5 Sportback 7 seven years ago, the new A5 Sportback has finally made its appearance! Blending elegant and emotional design with high functionality and abundant interior comfort the stunning A5 Sportback is certainly going to be extremely prevalent and is a true demonstration of engineering brilliance. The Audi designers have brought together dramatic shapes and athletically taut surfaces in the design of the new A5 Sportback. The stretched wheelbase, the short overhangs and the long, wraparound front lid with power dome emphasise the dynamism of the five-door coupé. The threedimensionally modeled Singleframe grille is significantly flatter and wider than on the previous model. The interior is 17mm longer than the outgoing model; the shoulder room for driver and front passenger increase by 11mm and rear knee room by 24mm. The sophisticated materials, precise fit and colour harmonies in the interior are typical of Audi. The horizontal architecture of the instrument panel creates a sense of spaciousness. The optional ambient lighting has 30 colours to choose from, so you can evoke a fitting interior mood. The A5 Sportback rates among the best in its class, with 480 litres of luggage capacity and with the rear seats folded down, it can accommodate 1,300 litres. You can choose between two petrol TFSI and three diesel TDI engines, producing between 190 and 286PS of power. Compared with the previous model, We have reduced fuel consumption by as much as 22 percent while increasing power output by up to 17 percent. The S5's V6 turbo engine with a hefty 354PS and 500Nm (368.8 lb-ft) of torque from 1,370 to 4,500 rpm accelerates the new model from 0 to 62mph in 4.7 seconds, and on up to an electronically-limited top speed of 155mph. It naturally features quattro as standard, with wheel selective torque control as well as an eight-speed tiptronic transmission that can freewheel for further efficiency gains between 34 and 99mph when the accelerator is lifted off. Stay tuned for UK prices, trims and specification when models open for ordering in mid-October.